Cypress Hill loves badass animals, big puffs of steam, and snowscapes. I know this for a fact because for the last few months, I’ve been following the group’s Instagram and National Geographic’s. It was only a couple of days after following the Cypress Hill account that I noticed the group was basically liking and commenting on everything National Geographic posted. Every time I scroll through Instagram, sure enough, Cypress Hill is there giving mad props to the amazing photographers at National Geographic. It makes sense. National Geographic posts ridiculous photos of some of the most batshit creatures and places on Earth. The truth is Cypress Hill probably follows the account for the same reason I do. It’s nice to leave work at the end of the day, light up a massive joint, and scroll through endless pages of funky-looking nature photos. Examples of Cypress Hill commenting on National Geographic’s Instagram photos. But the commenting and liking on National Geographic photos has lately been unrelenting. Now, every time I look at an image from National Geographic, I can’t help but scroll through the comments looking for a Cypress Hill post. The group is seriously obsessed. They need to chill out. I didn’t think much of this little corner of the internet until I recently mentioned this situation to my co-workers. “Wait, what? !” said one of them. “Like the group Cypress Hill?” I explained, yes, it was the 90s hip hop sensation going crazy for basically every thirst trap on National Geographic’s Instagram account. But my co-workers didn’t believe me. That’s when things got serious. A collection of Cypress Hill comments from the National Geographic Instagram page combined into one image. So I started counting. I discovered that Cypress Hill has commented on at least 25 of the last 50 posts from National Geographic. That only brings us back six full days. Twenty-five comments in six days. The group has also liked many of the photos they commented on, but just how many is hard to suss out. The issue is that the Instagram’s algorithm won’t automatically tell me when Cypress Hill likes a National Geographic photo, but it will typically show me when the group posts in the comments. Again, this is all sorted by the algorithm, which attempts to show you content that it is relevant to you. In this case, it knows I love nature and Cypress Hill. So what’s the takeaway? 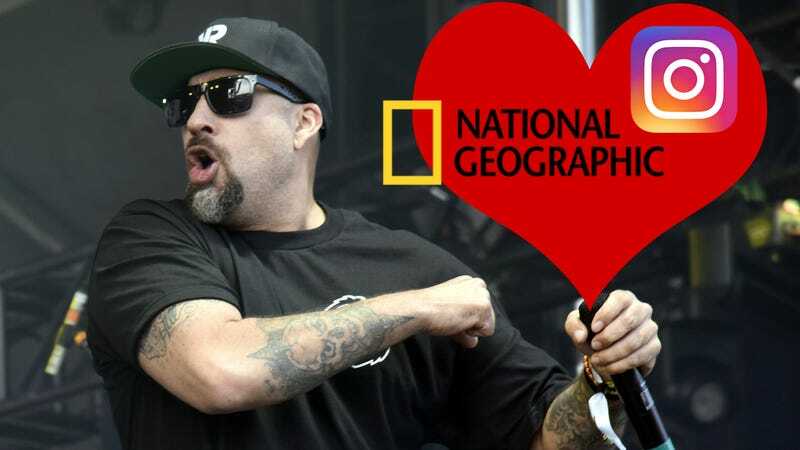 Well, if you’re not following Cypress Hill and National Geographic already, you really should. I also want to say to my favorite latino hip-hop artists: If you’re ever in New York and want to smoke some of Brooklyn’s finest and go to the zoo—I’m here for you. We reached out to Cypress Hill through the group’s publicist. We will update if and when we hear back.